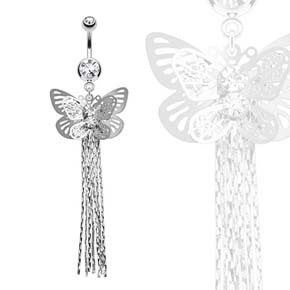 Pretty dangly butterfly belly bar with a clear jewelled top ball. The large butterfly which has intricate cut our wings and silver coloured dangles is on a 10mm (3/8") surgical steel shaft. The overall design measures 50mm x 25mm, and the butterfly has two small clear stones in the centre. The best eCommerce software by ShopFactory powers P12517. All-in one eCommerce and shopping cart software.